Falling. 2017. Oil on Canvas - 11 x 14 inches. It’s not an escape if you go there to heal. Your imagination is a refuge. It’s as much alive as any forest, and it is a place worth documenting and saving. It’s a place worth sharing and showing to others - so they remember that they have one too. Documenting what “is” has a place. It’s easy to judge and evaluate something that is already “there”, something to agree about, or to be “right” about. The danger in placing more value on realism is the fact that we are telling the truth, whether we like it or not, through our interactions each day, as told by our openness or closed-mindedness towards discovering new ways to see. Realism leaves a small window to the outside world, and many times artists aim to see through that lens and fall short due to technical or spiritual deficiencies. When an artist does truly speak in realism, you’ll find that they use representation to say something beneath the skin of their subject. Artist Marc Dennis. YOLO, 2018. Oil on linen - 40 x 40 inches. A perfect example of a brilliant realist. Click the image to see more of his paintings. This discussion brought to mind a quote by John Lennon. Lennon said “My role in society, or any artist’s or poet’s role, is to try and express what we all feel. Not to tell people how to feel. Not as a preacher, not as a leader, but as a reflection of us all”. While realism remains an important discipline, and one of the various ways that enable an artist to “resolve his fragments in man’s subjectivity”, as Rothko said, it often does so at the expense of understanding the deeper nature of one’s own voice - trying to look “real” or “good” might get in the way of depicting a more honest reflection. These reflections are found in realms that can only be accessed in moments of thoughtful interpretation. When you hear that voice and start to get to know it, you’ll hopefully stop caring about existing definitions of reality. You’ll use whatever means of representation that make sense. You’ll break rules, make mistakes, and let me tell you - it hurts. But the joy when you get that moment of recognition with a work is worth it. And when you share your work, and someone else gets it too, there’s a connection there that wasn’t there before. These are feelings and connections that can’t be bought - they MUST be made. This is the practice of humanity. There’s a responsibility to learn how to speak even more clearly, maybe even in multiple languages. The sound of your voice has been there this whole time, and it matters. Since I can remember, I have loved drawing. And yet, over the years, what has defined me is something beyond the process of recording. As life’s challenges approached, my choices in navigation have revealed what is most important. In the face of loss, I found creativity. This creative phenomenon can be traced throughout history, not just in my own story, but in that of wider scopes of communities and civilizations. The beginning of hurricane season is a reminder that from loss, we change. We can never get back what has been washed away but have the opportunity to take what is left and redefine our environment. When I was a kid, one of my favorite past times was trailblazing through the woods. My family lived walking distance from one another, and so whenever one place got boring, I could hop on my bike and ride to my aunt’s house, or go see what my grandparents were up to. As an adult, I still live a couple of miles away from where I grew up. This sustained proximity, while not necessarily the same as it was when I was a kid, has been the literal inspiration for the majority of my visual output. I am still learning new things just by having a morning coffee in my backyard. Family, or the way in which one thing relates to others, is essential to all things we experience in life. To broaden this scope, “family” also refers to anyone who makes up one’s day to day existence. Family is the foundation from which we build all things. In the spiritual definition of “father” and “mother”, we see family as a framework from which all things emanate. Today we can reframe the familial structure while still maintaining the output of raising a complete human being. Is it not extraordinary how humans have evolved to claim an expanded definition of love and family? I’m not afraid of losing myself in the process of growth. In fact, I am anticipating the discovery of new passions. I am praying to abandon whatever limits I might have and trailblaze through a forest that I have never known. Because I know that in navigating these woods, I have a basis for it all. The basis for all of my work, regardless of medium, is the personal dynamic of my observed relationship between things. Architecture is building upon the past, or as Leland Roth so marvelously put it, “Architecture is the chambered nautilus shell of the human species; it is the environment we build for ourselves, and which, as we grow in experience and knowledge, we change and adapt to our expanded condition.” In moving forward, we have the potential to change for the better. Embracing and Learning about the past gives us the foundation from which we build. Likewise, embracing and learning from the present allows us to reflect upon our observations. The Nautilus has become my spirit animal as I begin building yet another chamber. Pic from Neat Beats blog. While finishing up some sculptures, I decided to put on a playlist of Buddy Rich's drum solos. When I'm working, It feels like going underwater in the sense that whatever is going on outside of the studio is no longer there. As I worked with Rich's music as my backdrop, experiencing one solo after another, the vibrations and intensity of his performance running through me, I began to see a pattern. There's something that he does in almost every solo that is the same. While each of his solos are complex and unique to each performance (he did not "practice"), there's this pattern of escalation that occurs where he is pattering it out so fast and then it reaches a climax before opening back up into the main theme of the song. These were live recordings, so you could hear the crowd responding to this moment. There is a threshold that I think every artist encounters when they get praise for their work. Praise can be great, but it can also inhibit growth. When your work makes people happy, you have the option of getting paid to do it. While Art exists beyond commerce in a world of progress and natural conception, the transition between doing your work and getting paid for it has a lot to do with one's personal level of comfort with making people happy, and a willingness to learn a little about documenting your work. Making people happy is not painting whatever they want, or following existing trends which have already proven to be successful. That, in my opinion, is not creativity. However, when an artist trusts their own voice, they have the ability to use that voice to continually grow. When one embraces that doing their personal work brings joy (or whatever feeling you're going after) to others, there is a reciprocity to creativity that has the potential to be channeled into commerce. When Buddy Rich did his wild accelerations, he was being what he had been his entire life - a force of nature, and that signature style became the trademark of his prolific recording and performance life as an artist. He was introduced to art from an early age, embraced that which brought both he AND others joy, and made it into a living. A commissioned steel sculpture, entitled "Onward", gets a fresh coat of paint before its installation in Bay St. Louis, MS.
Artists get into big sculpture for different reasons. What got me into steel was a friend who believed that I was more of a sculptor than a painter. Outdoor sculpture is such a different process than say, stretching a canvas to complete a thought. Safety is a major concern when tons of steel are involved. While some artists claim to do it all from start to finish, I have no shame in saying that when something could cause major harm, my course of action is to partner with a niche professional to ensure my clients have the most enjoyable and safest experience with their artwork. The most creative fun occurs in the design phase anyway! This is where I visit the site and gather visual information to think about as I conjure up gestural renderings in my sketchbook. Often times, a client doesn't get to see these sketches because they are literally all over the place - I jot down anything and everything that comes up, and find how these things can be honed into one conversation between forms. On this particular project, the client knew they wanted the piece to be called "Onward". It was a steel commission for their private residence along the beach in Bay St. Louis, Mississippi. The client wanted to pay homage to the location of his home, which was once "Camp Onward", the first integrated girls' summer camp in the state of Mississippi. Capturing the lighthearted spirit of little girls playing on the beach became my goal. Detail from "Onward" sketches, drawn from wild sweet peas picked from the client's yard. A detail of my sketchbook shows how I got inspiration not only from the client's wishes, but also from what was naturally growing on the site. I immediately spotted the delicate little pink flowers of wild sweet peas growing nearby, and used them as stand-ins for the "girls". I drew them up close to study their movement, and compared them to my figurative studies of children making playful gestures. Other things which inspired the work were the sea birds, the clouds, butterflies, and the way wind affected the movement of trees. After some time to sketch and focus, I created a few pieces in maquette form, and invited the client over to see them in person. When working by commission, it is natural to want to make a client happy, but I've learned that it is best to show my personal favorites - pieces that I would make anyway. My personal favorite of the group ended up being their personal favorite too. Rendering of "Onward" maquette in initial location. The initial placement for "Onward" was to be as a focal point along the home's driveway. The client and I were first considering raw steel to allow the work to oxidize naturally as I had with an earlier work, but because of the work's proximity to the sea, a solid coating of paint was needed to provide protection from the harsh elements. To create a modern contrast to the landscape and also bring forth the piece's spiritual nature, a solid white was chosen to bounce spiritual "light" onto the viewer. In natural form at Manufab in Bay St. Louis. The piece gets welded at the joints before getting a nice coat of paint. When possible, I enjoy partnering with local shops. The people who work in steel shops are usually creative as well and have fun working on art projects like this as a break from the usual bridge building project. The client worked closely too with a good friend who was a landscape architect to ensure the work had a spot that offered protection, and so instead of placing "Onward" near the driveway, they decided to place the work beneath the huge oak trees on the front lawn. This added another visual element to the work, because on sunny days the light shines through the branches and creates silhouettes on the solid white surface of the sculpture. "Onward", installed beneath the branches of a majestic oak along the beach in Bay St. Louis, Mississippi. You can see the shadows starting to creep in from the left as the sun crosses over the sky. Commissioning a big steel sculpture is a wonderfully fun process, and is often times a community effort. As an artist, I enjoy the dialog of creating a site-specific and unique work for my clients to enjoy and share with others. The client had four mini versions of this work created for each of their four children. The process overall doesn't have a set time limit, but on average and without delays, it could occur in as little as 8-10 weeks. The most rewarding part of creating big outdoor sculpture is that it is enjoyed by the public in a way that does not require a complete understanding upfront. Wondering is encouraged. Sculptures like this tend to take on a life of their own after completion, and when created for a particular place, the work inherently becomes a part of it. 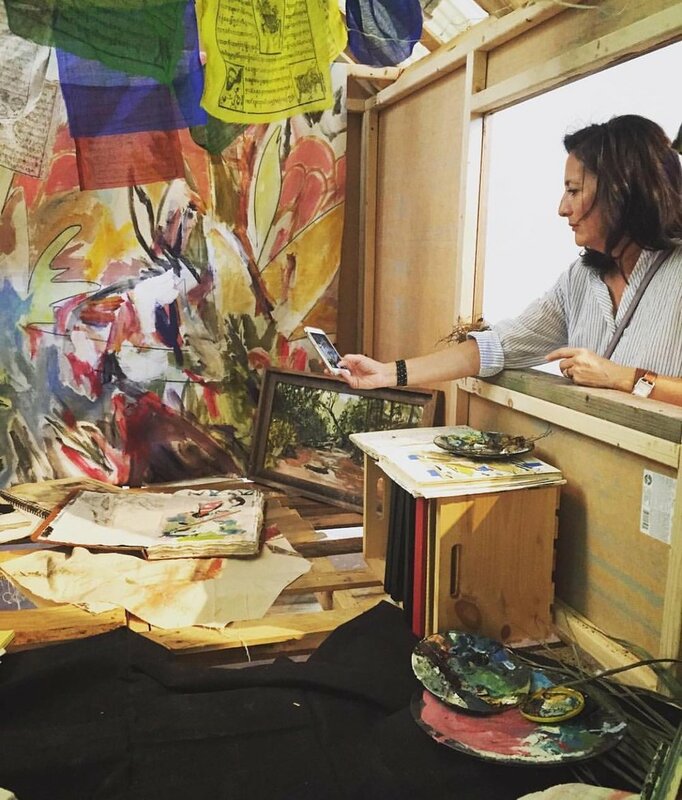 Designer Colleen Waguespack has a gift for creating warm spaces with original art. Artists are notorious for having interesting living spaces. Many of us collect things, and tend to have stories about our belongings, as most collectors do. The idea of minimizing all of that to create a space that reflects total balance and minimal placement seems counterintuitive to our nature. But over the years, I have come to admire and even wish for the help of a gifted interior designer in my own sphere. A great interior is a work of art in itself - a collage of textures, color, form, and all with a purpose to affect those who enter. When designer Colleen Waguespack shared this shot of a bedroom she designed for a friend, it brought me such joy because many times when I am creating these paintings, I am not thinking about where they are going...I'm not conscious of matching furniture or whatever. I'm trying to work through something on my own terms. My work keeps this energy of being alive, and it takes a designer like Colleen to take this raw material, and turn it into a place that works for a greater good. A livable extension that provides a sanctuary for someone else. "Drenched in Paradise" Mixed media on canvas - 42 x 54 inches. This piece was created during the rainy Spring. I had this beautiful speckled king snake living just outside of my studio. I would look for him each morning as I walked past. You can see him slithering across the bottom of the painting. Today's install is courtesy of Ann Connelly Fine Art in Baton Rouge, LA. Ann Connelly has been in the art consultation business for well over 20 years. She represents contemporary artists whose focus leans towards botanical abstraction. Her latest install features three of my jewel toned paintings on paper, which were framed by the gallery's framing experts, hung over a fireplace in a newly designed living area. I usually don't get excited about art matching the furniture, but I have to comment on how much I love the velvet pillows and orange table, that make this otherwise monochromatic space a design jewel. Art Installed: Jewel Toned Paintings. Image courtesy of Ann Connelly Fine Art. When Ann shared this picture on her Facebook page, a commenter asked if these were linocuts or lithographs. I guess the printmaker in me is alive and well - I do think in terms of layers and building imagery like a printmaker, which is why I studied Printmaking in combination with Drawing at the Memphis College of Art way back when. As I was working on these, I was reminded of the times I used to help my father process photographs in his darkroom. He owned a photo studio in Clinton, NJ., and I loved being in there with his music blaring while we would process pictures together. He would sit at the enlarger and ask me to hand him the paper, make the exposure, and then hand it back to me so I could then place it in the baths of developer, stop, and fixer. The red darkroom lamps cast their light on every surface, making the experience feel like a dream, and when we finished our work, the door would open and the rest of the world, with all of its bright lights and demanding colors would come flooding back in. The darkroom was like our refuge back then. These pieces are NOT prints, or photographs, but are done the slow way - painting by hand. The monochromatic tones were masked off to set the stage for the drawings (which I did from some of the paper sculptures I have in my studio) in paint using a variety of brushes and even sticks to create the lines of the work. I hope you enjoy them! To see the rest of my jewel toned paintings from this series, visit my page on Ann's website. Palette Study: Observing life as an open-ended mood board. A large part of my artistic practice is based on real-time observation and recording. 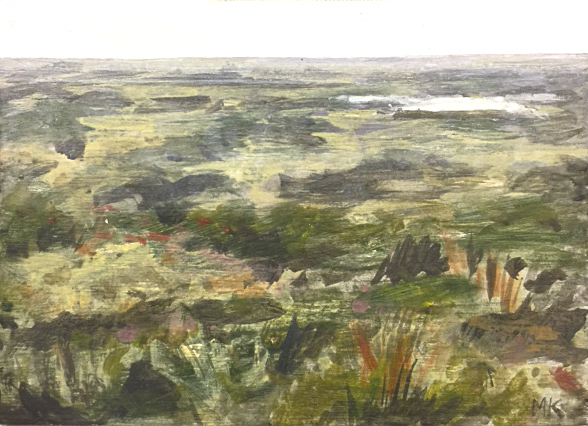 When I first started painting landscapes regularly in 2008, I was using it as a way to reset my mind. All that gets accumulated over the years, in my case all that I had learned about art and being a working artist became a burden to the person within me who just liked to make things that felt right without concern about who "likes it" or not. Particularly in school when I was asked to write about the concept for bodies of work before I even started making them, I struggled. Later on, I came to understand why writing is introduced in the beginning of the creative process as a planning method for organizing thoughts before action, but of course not everyone goes through the front door of thought. In fact many artists who I relate to on a personal level share my method of reflecting upon creation. This process of creating a statement based on an amass of actual experience presents quite the challenge, because I could easily work from photos and make an entire body of work about Tokyo without actually being there, but I believe being there and working through the experience of being there makes the quality of my work more authentic, and it is my belief that we need authenticity in our lives - not just vibes, but a true understanding of what makes the vibration what it is. So what happens if I make a shift in my way of thinking about how things should or shouldn't happen? Do we all arrive at the same result when experiencing a person's art either way, or can YOU tell the difference between surface work and the deep stuff? And so I carried around this conundrum when it came to mood boards...rejecting the idea of collecting stimuli that was not taken directly from personal experience. How much easier it would be to collect images of things that already existed from all over the world instead of relying upon myself to create a personal palette from observational scratch. Maybe I chose the long way around with my rules and such, but in doing so, I can tell you what's growing in my back yard because I've been there studying it for years. I have become quite the expert in documenting the subtle temperature changes in color found in the landscape as seasons change, the corresponding palettes and blooming cycles. So it seems that I have been creating mood boards all along - but in reverse! I'm delighted to share with you a brief synopsis of my findings, in the form of these swatch palettes, with selections of my favorite colors from each time of year. October/Fall Palette. 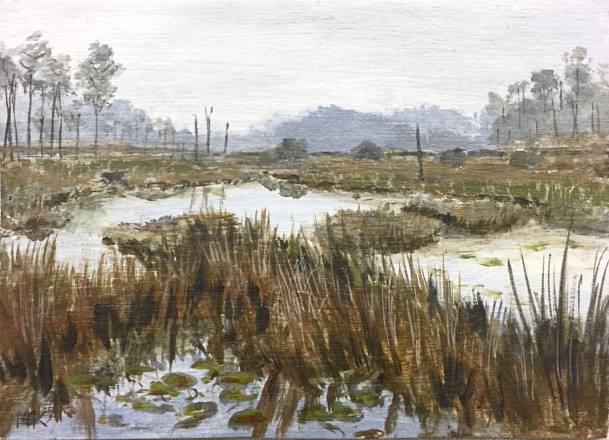 Marsh painting from Big Branch Marsh NWR. Autumn is about letting go of all the beautiful things we relished in Summer, embracing the natural transition of life into earth. My favorite colors in Fall are actually the ones that play between the crisp, soft blues on cold days and the golden wheat, chestnut, and deep earth tones that create a wonderful foundation for their evergreen accents. Without a foundation of these yellow ochres, raw siennas and burn umbers, we wouldn't have the same appreciation for the rest of life's colors. January/Winter Palette. Painting of trees in my backyard in Lacombe, LA. Winter palettes are distinct from Fall palettes because they largely represent the evergreen population which gets so much play during the holidays versus the bold changes that occur when leaves change, but my favorite thing about Winter is moments is when I feel so c-c-c-cold, and then the sun comes out. So while the color palette is rather stark - icy ultramarine blues, muted bark tones, and deep cool greens, there is that wonderful hint of peach which represents the sun hitting the bark of the cold trees, and this peach becomes more prominent as the year continues. Spring Palette. Painted from the gardens in my front yard which house a variety of lilies, wildflowers, grasses, jasmine, and a Japanese Plum. There is no time of year that rocks the world of minty greens, sunshine hansa yellow, corals (remember the peach?) and plum hues like Spring. A lady I adore once described her friend's style as "fauvist at heart", and I think that's really what Spring is all about...pastels balanced against their bold complements. June Palette. Painted from Bayou Liberty in Slidell, LA. When people discuss hallucinations from heat of the dessert, I can relate from my own sphere. It doesn't take an ounce of peyote to feel the electricity of a hot summer day in the swamps. All of the colors are on fire, with perhaps a little relief in the delicate summer blooms, but Summer is and will always be the most passionate palette in my book. My favorite colors from this time are the deep cadmium yellows and reds, the cobalt and prussian blues. In between the changes throughout the year, there is one thing that seems to remain consistent, and that is the colors that happen at dawn and dusk each day. When mixed with these seasonal palettes, we experience a complex harmony in our environment. And so this idea of studying nature is not new, but following the path of studying these small changes has given me an appreciation for details that I had missed when I only knew the surface, and a deeper connection to life itself. I'll leave you with this look at the seasons according to artist David Hockney, where he documents the same path from his hometown at different times of year, and how he used his love of painting these changes to influence how others see the world. A week or so ago, my LinkedIn profile informed me that I was celebrating another year at Mia Kaplan Studio. I can still remember the moment I decided to make the leap into the unknown, having had a salaried job during the day and painting at night, working in a place that was ok but far from my dream, and finally reaching the point where I decided that I needed to make some drastic and serious changes. I quit, I jumped, and I admit there was panic at first, fear that "living the dream" was but a masked nightmare that involved rolling around on the floor screaming in simultaneous terror and delight, unsure of which feeling was real, like falling in love before the lights turned on. It wasn't until I learned how to chill out, and looked around to discover that I had survived, that I got behind the wheel of my ship and found the patience to learn how to navigate my new life. My "new normal", as I lovingly call it, was created by making a list of what I wanted each day to be like: waking up surrounded by people I love, having positive working relationships based on shared values and a common goal of making the world a little more delicate and thoughtful. I shifted my focus to conversing primarily about things that mattered to me, and worked hard to become a listener. This internal work took years, and is best described as a shedding of skin, an undergoing of rediscovering things I had forgotten about myself. On occasion I would assist my husband on his photo shoots, and one of our subjects was a gifted jeweler named Katy Beh. The photos were for an article being written discussing rituals, and we photographed her at home writing on yellow steno pads. Each morning, she told us, she would write without any specific goal, just to empty her mind, and I found this fascinating, much like my own process with sketchbooks in the morning. So I tried it at times when it wasn't appropriate to draw, I simply wrote whatever was on my mind that morning. It was cathartic, and deeply satisfying to empty my thoughts onto the pages and move on. My new writing ritual turned into the inspiration for the yellow notebook page patterns used in "Flowers for Peggy". The second major change I underwent was unexpected. My cousin Scheherezade in Los Angeles convinced me to join her on a couple of Angelino escapades, two of which were an 8-hour white tantric yoga workshop, and a five day transformational training program called M.I.T.T. (Mastery in Transformational Training). I was just going at first because she asked me to go, expecting nothing aside from my hopes of being good company for her. It is hard to illustrate the effects of these experiences, but when I was referring to the rediscovery of things I had forgotten about myself, these experiences provided such insights. I had forgotten about the special powers I have had since I was a kid, powers I feel that we all have of clear intention and intuition, but for whatever reason I stopped trusting these powers. So I took them back! Here's how it happens: you're walking along and suddenly something grabs your attention. It speaks to you. It could be a thought or an image, or the way pine needle trees grow in my case. The thought of managing something so organic as coming across and collecting fleeting moments of inspiration might seem like a buzz-kill, but I see it the way many people have connected to shopping, as a "retail therapy" of sorts whose transaction involves no salesperson or intermediary. It IS possible and even considered normal among workhorse creatives to develop a system for collecting thoughts, and lately I have expanded my repertoire beyond the sketchbook and yellow steno pads to include technology. Apps like Evernote are an example of how technology has entered the picture to assist in the creative process by allowing one to collect and categorize information, and even share it with others. I was not into the idea of "mood boards" at first, but to manage visual information and reference, Pinterest is like having an endless supply of cork boards to find common threads in a big picture. It wasn't until I added a bunch of pins of my work to my Pinterest page that I was able to see a large volume of my work at once, and it helped me understand what I was doing. Furthermore, Pinterest suggests similar pins to complement imagery, which is revealing to see how something so personal fits into the aggregation of everyone else's imagery. My favorite discovery from Pinterest was the popularity of my line drawings for boards about tattoo ideas. Maybe I missed a calling as a tattoo designer? So I find myself currently in an external phase, having renovated this old mental house, I have been working lately on physical projects. Using technology as just another tool in my workshop. After all, we live in a time where 3D printers can print a bust in marble using fifteen photos of a person. We are not so limited by our physical capabilities, but by our belief in our own potential as human beings. There are less limitations between our ideas and our output now more than ever. River Gallery Sculpture Garden presents artist Mia Kaplan’s latest addition to her installation in the garden along the Tennessee River. “Blooms Along the River” is a continuation of the works she installed during her exhibition earlier this year. Kaplan is a multi-disciplined artist who works in response to natural environments. 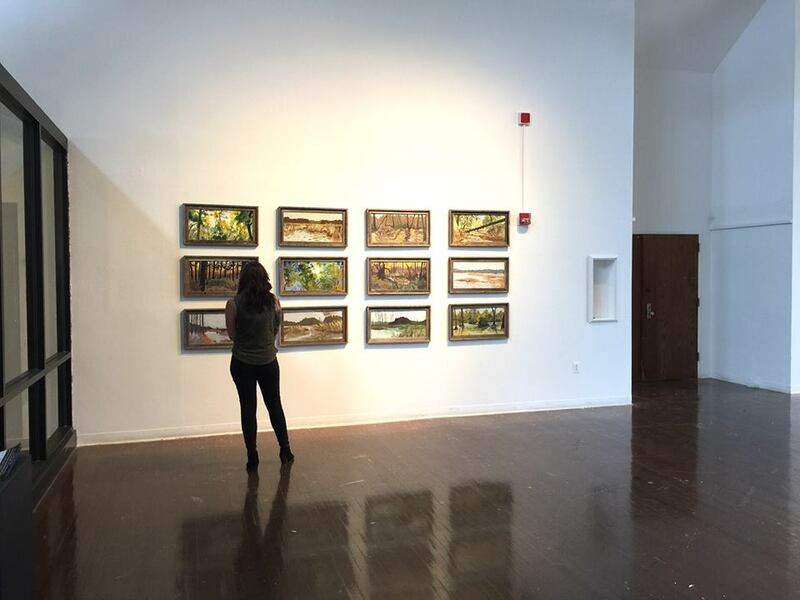 During her last visit to Chattanooga, she painted her sculptural blooms entitled “Chattanooga Reliquaries” while drawing the palette compositions directly from the surrounding landscape this past May. She will be bringing primed pieces in and will be finishing them on site in the days leading up to the opening. Visitors are welcome to observe and meet the artist at work on October 21 & 21, between the hours of 10am and 2pm at the River Gallery Sculpture Garden. Purchase of sculpture and information on the annual exhibit are available through River Gallery. River Gallery Sculpture Garden is one of the 195 sculpture gardens selected worldwide for listing in the International Sculpture Center's Sculpture Parks and Garden's Directory. The garden is further recognized with a listing in the Smithsonian Institution's Archives of American Gardens. Contact River Gallery at 800-374-2923 for more information. Steel sculpture commission (in progress) for private residence. The Commission Process: how to commission a work of art for your home or office. The question of "how do I commission a work" comes around often enough to discuss. I love commissioned work because it allows me to bring conversations I have with the work's owner into play. Of course, finding a piece that speaks off the bat to you is always a great feeling, but sometimes it's just too large or too small for the place you have in mind. Or maybe you fell in love with a piece before and missed out on buying it. This happens a lot too! Don't fret. Commissioning a work is an exciting process that is not so mysterious. There are some understandings that must be made here, and of course I'm speaking on behalf of my own procedures. Firstly, I am not an artist who recreates the same painting over and over again. Some artists do, but I won't. When I used to work in an art gallery, I experienced first hand a customer walked in, pointed to a piece and said "I own the original", and the painting in front of him was an "original" too. He paid good money for a piece that was being done over and over for profit, and I witnessed the horror of his realization. So understand that commissioning a piece might involve using a similar palette or subject matter, but is NOT considered an agreement to reproduce a previously created work. This policy maintains the studio's integrity and the value of owning an original work. So the process begins most easily when you are open, and works with almost any fine artist. Share the guidelines you have about the work you want. For instance, you could share your budget, the size of the work you need, the palette, desired materials, and any images of previous work by the artist. From here, the artist will determine if this is a project they can take on, or there may be something existing in inventory that already fits the vision. If your guidelines are accepted, then you will agree upon a price and a deadline for completion of the work. In order for an artist to begin working on your piece, you will pay a non-refundable deposit. For smaller works, the deposit is usually half of the purchase price. For monumental pieces, a design fee covers the design phase of the work, and the remainder is addressed during production and installation of the work. When your piece is complete, your remaining balance is due before your work is delivered. Keeping communication open is important if there are any delays or changes to your agreement. When your commissioned work is completed, host a party to celebrate it! Seriously- Art collections are a wonderful way to share ideas and conversations. If you're in business, hosting a party at your office to celebrate your new art is a great way to catch up with your community. Artists will enjoy meeting like-minded people who may also appreciate what they are doing and decide to get a piece as well. An artist with more collectors means that the work you have commissioned builds in significance and value over time. You're investing in an artist's vision, and your own vision as a person or company. That's the art of patronage, and the difference between matching the couches and creating a meaningful art collection. Photograph by Björn Wallander for Architectural Digest. There's a phase where my mind goes into sponge mode - it is perhaps the most awkward of phases, like a mental New Moon. Everything soaking in, it gets messy and colorful to say the least. Only work can iron it out, and there's thankfully so much to do. This year is an exciting year for me - I'll be traveling back up to Oxford, MS to do a performance-based painting of my steel piece, Swamp Flower , during the Double Decker Festival in April, and I'll be exhibiting some landscapes at Southside Gallery along with my friend and fellow nature painter Carlyle Wolfe. The summer brings more fun - I'll have a solo exhibition at River Gallery in Chattanooga, TN. The gallery has both an indoor and outdoor gallery space, so I'm working on both interior and exterior pieces for this show. In September, I'm thrilled to announce that I'll have my first solo museum show at the Isaac Delgado Gallery in New Orleans. I fell in love with the greenhouse-cathedral feeling of the space, and will be throwing all of my sculptural ambitions into the exhibition "Twilight and the Dance of Trees". But this post is really about the beginning of all this, and where I stand as of January 2016. I'm painting, and painting, and painting. Stretching canvases, going for as many morning runs as I can, and making my recordings patiently. There's a plan, and I'm working through it. Working through some of these "New Moon" paintings. The New Orleans space is still open, but mainly by appointment so I can focus on producing my new work. You should really go to supper club - I think that is the perfect experiential setting to see what I do, and what Melissa Martin does there is absolutely delightful. There are some great swamp paintings to be seen amongst her grandmother's cajun aromas, the infamous duck wallpaper, and a new room with some playful swamp abstractions from the fall. As televisions become more commonplace than bonfires, our return to nature is not only inevitable, but necessary. Big Branch Marsh. May 2015. This year I took my time to learn more about what I was drawing. After a while of seeing the same places over and over, returning faithfully to the scenes to notice what growth had developed, I began to notice not only the seasonal beauty of these small triumphs in nature, but I began to wonder if perhaps these plants had a purpose in my life unbeknownst to me. While in Colorado, I met a wondrous lady who shared a fascinating reference, namely a book by Sunsun Weed called "Healing Wise" which talked about the medicinal powers found in many common weeds. Sadly, many of the plants in her book grow in the North rather than in the South where I am. Her profiles of plants, like the dandelion who I do see often, revealed the potential of a dialog between myself and the weeds I was drawing. Perhaps we are all more than we seem. A cardinal flower found growing along the bank of the Abita River. September 2015. Cardinal flowers depend on hummingbirds for pollination, and were used by the first Americans to treat intestinal diseases. Is this why I am being drawn into these plants? It can't just be beauty because there are so many beautiful things to focus on otherwise, so many different paths to take in creation. I certainly never intended to become a drawer of flowers or a botanist. However, there remains this desire within me to know the names of what is growing around me, to tell a story that is no longer just my own. I began by trying to paint what was familiar to me as a child who spent a lot of time in the woods, and now that I'm familiar I want to go further. The pine trees in this area, for instance, are tied to Lacombe's history as a lumber farm. The colonial transformation of this landscape which was once predominantly Choctaw has had a number of ecological consequences. The burning of our forests is a result of lightning storms which used to naturally create fires but no longer happen due to civilization. We now have controlled burning in our wildlife refuges. An interest in natural medicine is not the norm here, and I'm just starting to learn that there are an abundance of antibiotics, detoxifying agents, and healing plants growing right in front of me, and I've only scratched the surface by documenting them. 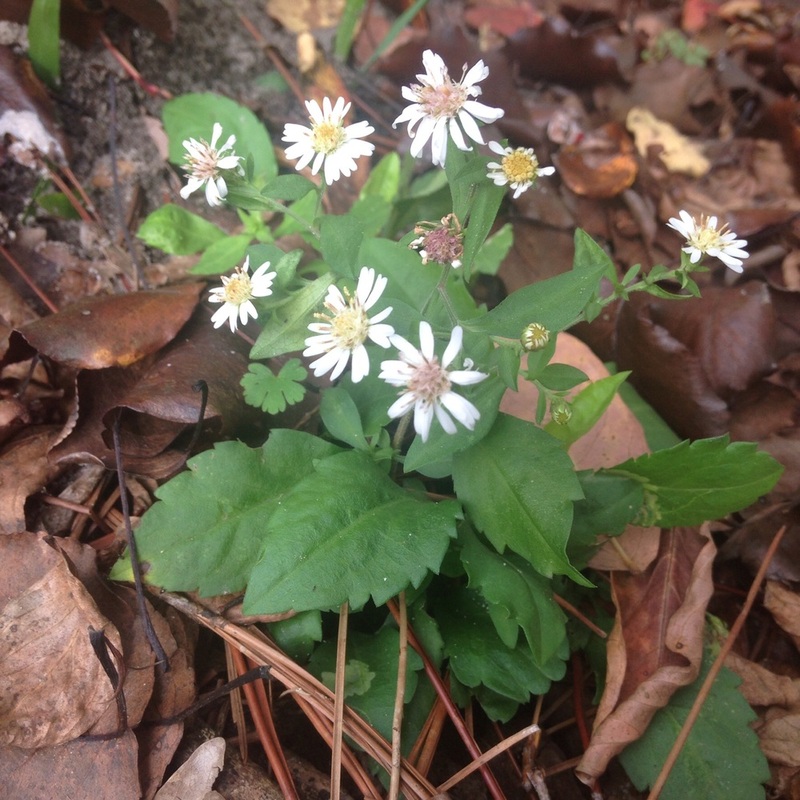 Unidentified, found roadside. Lacombe. December 2015. Towards the end of last year, I began keeping a journal for each month of the year so I could more specifically record the landscape as things change. I do hope that 2016 will allow me to focus and gain a more complete understanding as I fill the pages of my journals and expand my references for identifying my subjects. I plan to learn more about the nature and history of the plants I draw, and I'll share those findings with you here. Big Branch Marsh. Water lilies in full bloom. May 2015. Young artists need to understand what it means to draw from the world, what it means to create original work versus copying images they find on the internet. There is a difference between Art and simply making images. The difference lies in process, and thankfully process can be shared and taught.